ANSWERS Book Reviews » Blog Archive » -"WordPress Complete:"
"A comprehensive, step-by-step guide on how to set up, customize, and market your blog using WordPress"
This really is the most ‘complete’ book on the WordPress blogging platform. It has chapters on all the elementary stuff for beginners, how to get started and how to use all the basic aspects of the program. It also offers plenty to keep those that have been around a while busy. There are chapters about the WordPress themes. How to choose a good theme to start, modify a theme for the intermediate user, and how to program a new theme from the ground up for those who are advanced. The chapter on plug-ins and creating widgets was particularly helpful to me. « "Religion of Peace? : Why Christianity Is and Islam Isn’t"
3 Responses to -"WordPress Complete:"
I have been trying to figure out how to do widgets on WordPress for a while. Finally gave up. Maybe I’ll see if I can find this book in the library. 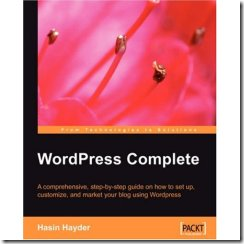 This book has a whole chapter on developing Plugins and Widgets for WordPress. Also, a chapter on how to develop a new theme.